I've always been a baked bean lover. Instead of making sweet and smoky Boston-style baked beans, lately I've been making baked beans inspired by the flavors of the Mediterranean. A few days ago I made this tasty version of baked white beans, chock full of garlic, fresh herbs, olive oil and fresh lemon. I baked the beans in a beautiful red Le Creuset enameled cast iron dutch oven, and the finished dish looked gorgeous and tasted just as good. 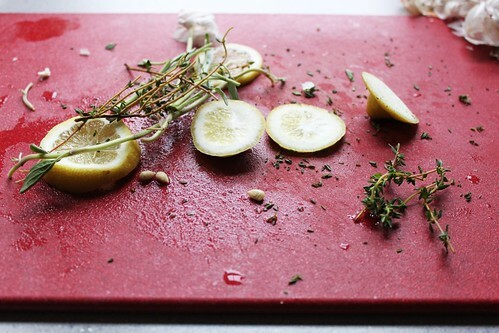 The flavor is really fresh, fragrant herbs with the bite of black pepper and brightness of lemon. The beans on the top were tender and but still intact (the way I like 'em), and the beans on the bottom and edges had a golden, crisp crust. Hot olive oil and a good hot cast iron pan create pure magic! Serve as an affordable and satisfying main course or a side dish, along with sauteed greens or salad and other seasonal vegetables. 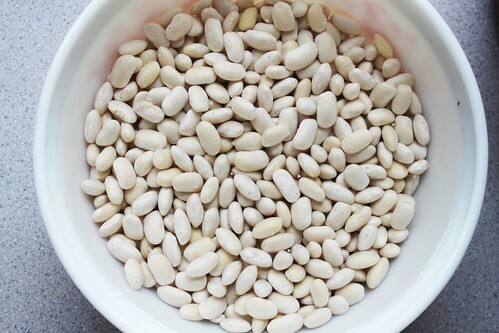 Soak the beans for 24-36 hours in a large bowl or pot filled with water. You want the beans covered by about 6 inches of water. Drain, rinse, and refill every 12 hours while soaking (save the used soaking water and use for plants, it is full of plant-healthy nitrogen!). Once they are fully soaked, drain and rinse well, and set aside. Heat oven to 350º F and lightly oil a large dutch oven or dish. 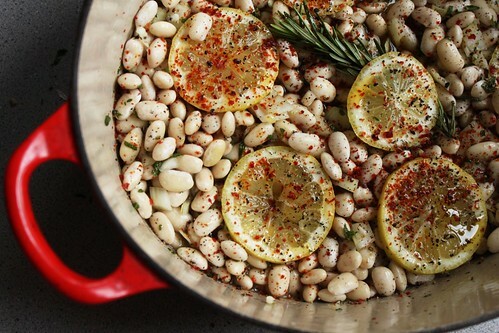 Place rinsed & soaked beans in dish with onions and garlic, and pour on 4 Tbsp olive oil. 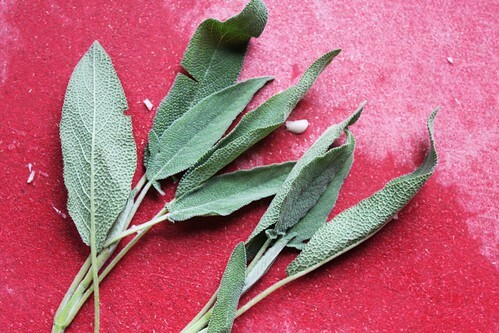 Stir to coat, then add sage, thyme, and marjoram, and stir to mix. Add enough water or broth to be just below the top surface of the beans. Nestle the rosemary on the beans, then cover the surface with lemon slices and sprinkle with pepper and chili flakes/aleppo pepper flakes. Cover dish with foil and puncture a few times to let steam escape. Bake for about 2 hours. Baking time will depend on how long you soak your beans, how old your beans are, and the general humidity level in your house - your beans may take more or less time. Be sure to check on them after 1 1/2 hours - if all the liquid has cooked off and they seem dry, add a little more liquid and continue to bake. If there is still liquid, just put back in the oven and keep baking until they are tender to your liking. Remove from oven, drizzle with olive oil and season to taste with unrefined salt. Serve. Make it a meal by serving with sauteed greens or a leafy green salad, cooked baby beets with fresh thyme (or other seasonal veg), and crusty homemade bread.